Vauxhall Insignia 1.4i Turbo review | What Car? What is it? A new 1.4 turbocharged version of Vauxhall's fleet favourite. 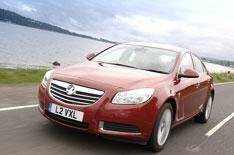 Vauxhall sold no fewer than 37,000 Insignias last year- the vast majority to fleet customers. Not surprisingly most were sold with diesel engines but Vauxhall reckons there still a healthy demand for petrol power, hence this new 1.4-litre turbocharged petrol engine. What's it like to drive? The new motor responds in a similar manner to a refined diesel engine. It produces 138bhp so despite the Insignia's substantial weight it pulls strongly and smoothly away from the mark. It does run out of puff and gets a bit boomy beyond 4000rpm however. It's also pretty decent on fuel. Thanks to start-stop and some clever electronics it will return almost 50mpg on the combined cycle. Insignias are notoriously sensitive to engine and wheel sizes, and suspension settings, but we reckon this 1.4-litre version is as good as it gets. Its electric steering a first in the Insignia line up - is nicely weighted, there's plenty of grip, while the relatively light engine up front gives the car a neutral, balanced feel. What's it like inside? The cabin is notable for its quality materials and excellent fit and finish. The seats are supportive and there's plenty of adjustment for the steering wheel. Those swooping exterior lines do limit visibility somewhat and that rakish roof line impinges on rear passenger headroom. The centre console looks great, with its banks of buttons and switches, but it can sometimes be a bit confusing to negotiate your way around the various functions. You can however always amuse yourself with the latest interactive sat-nav which allows you to customise your route options. Should I buy one? If you are a private buyer and you probably are if you're in the market for a petrol car these days - then you may be put off by the Insignia's heavy depreciation. You can offset this by getting a healthy discount, but no matter how tempting that reduction we reckon you'd be better off letting someone else take the initial hit. Hang on a couple of years because while this Insignia is decent proposition new, it'll be an absolute cracker as a used buy.